The news was updated on March 19, 2019. 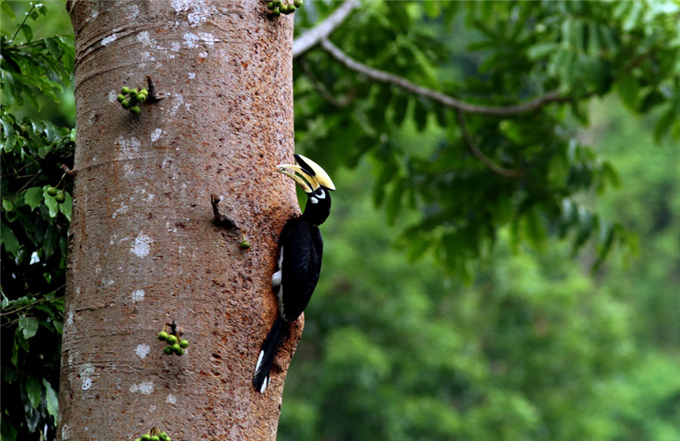 A male Oriental pied hornbill prepares to feed his chicks hiding in a hole on a tree near Shiti village in Yingjiang county, Yunnan province. Bird guide He Zhengzhong made it very clear to his son and daughter that they should not use a slingshot to hit birds, though that was his favorite childhood pastime. “Absolutely not now,” he said. “Especially when the kids have summer or winter breaks. No one can play with a slingshot. The birds are too precious. “If you hit one bird in the spring, you will lose a whole nest of them when autumn comes,” he added, citing an old saying. The 30-year-old makes a living as a guide for bird watchers who flock to his hometown, Shiti village, which borders Myanmar in southwestern China’s Yunnan province. Statistics provided by the Yingjiang county bird watchers’ association show the village is home to over 400 types of birds, including several rare ones such as the gray peacock-pheasant, spot-bellied eagle-owl, and hornbills. Being knowledgeable about the features and habitats of these rare birds, he has emerged as a much sought-after guide for professional nature photographers and bird watchers. “The other day, I spotted several gray peacock-pheasants. I shared a video on my WeChat Moments page and many people contacted me afterward. I’ve been so busy lately,” he said. Every day, He receives an average of 10 clients. He manages the No 2 “bird pond” near the village, and arranges for his clients to watch the birds and take photos from camouflaged positions. He uses worms and corn flour to attract the birds to the pond. Each client pays 60 yuan ($8.92) per day for a viewing spot. One of He’s clients, Sun Xiaohong, is an avid nature photographer from Beijing. He visits Shiti once a month. The viewing spots and bird ponds are planned out by the village and the county bird watchers’ association. Shiti has 40 spots for watching birds. “We keep a certain distance between the spots,” said Ban Dingying, head of the association. “We try not to change them too much because conservation is the most important thing for us. If guides find that the birds are building nests, Ban said they will usually not disturb them until the nest is built. Birding has brought in an increasing number of visitors to Shiti. Over 20,000 people visited the village last year, with the average visitor spending around a week there. Per capita annual income in the village grew from 2,000 to 8,000 yuan. Situated at the southwestern tip of the Hengduan Mountains and the southern extension of the Gaoligong Mountains, Yingjiang county is home to a wide range of biodiversity. Forest coverage is over 73.9 percent, with more than 559 types of birds. Since 2015, Yingjiang has hosted three bird-watching festivals. Rural tourism generated over 20 million yuan in earnings for the people, county statistics show. The county government said environmental protection is a top priority. Pai Zhonghua, head of the village, said the village has a special ranger team to fight illegal logging, poaching and electric shock fishing. Those who report activities that are damaging to the environment are awarded 200 to 2,000 yuan. During the rainy season from June to September, when there are few visitors, He and his wife rest. However, they still insists on feeding the birds every day.